I’m so excited to announce that Mohanik’s second album, At Amarbayasgalant, is available for purchase on iTunes! Please do yourself a favor and buy this wonderful album – you’ll be getting some fantastic original music and will be supporting independent Mongolian musicians. 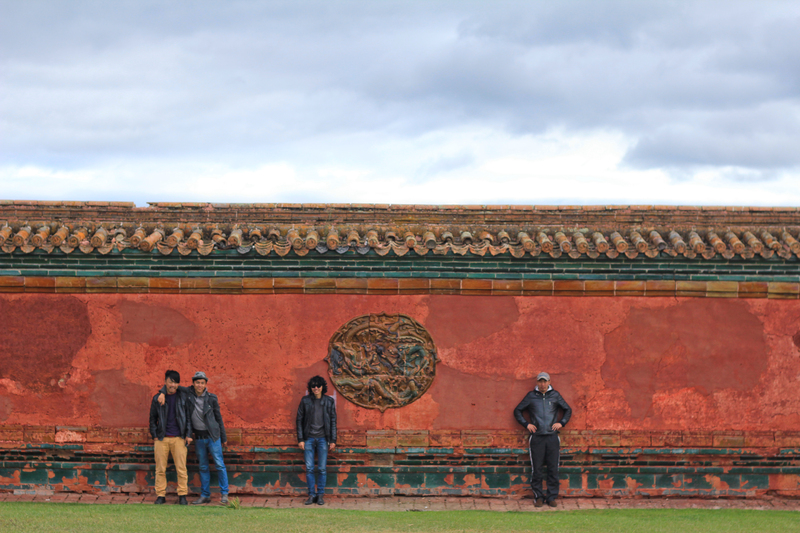 It’s hard to stay up to date on the Mongolian music scene from the U.S. and so I might be a little late with this most recent bit of news, but I’m still excited to share it. HiFi Records (Mongolia’s premiere record company) now has an online store! Now, it’s all in Mongolian and I believe you need to sign up to be able to purchase music, but still! You can see all that Hi Fi Records has to offer and hear clips from the albums. It’s a great way to get a taste of what the fantastic music scene in this small country has to offer. Here’s the latest Duunii Klip: Royal Beat Crew and Persuis featuring Gennie. It’s a great example of the frequent collaborations various musicians are involved in here. I learned about Gennie over a year ago from talking with the director of Mongolian Bling (which just finished post-production!). He follows her throughout his documentary and recommended I get in touch. Gennie is one of the only female rappers in Mongolia. I heard of the Royal Beat Crew a little over a month ago now. I’m told they incorporate khoomii (throat singing) into their beats, but not in a terribly substantial way. Still, a fun idea. I still haven’t been able to figure out exactly who Persius is. An expat who came an went? A wayward traveler? Perhaps I’ll run into him this weekend? Here’s today’s Duunii Kilp! It’s from an album released last year. Rapper Gee teamed up with the folk rock group Jonon for a record called ‘Mongolz’. Based on my rough rough translation skills, I think this song’s title means something like, ‘Leave My Country To Me’*. It’s basically about a near future where the environment has been destroyed to the point of extreme desertification causing the singers to wander the wasteland in search of the land they once knew. But, I’m sure you can get that from the video. Hi. 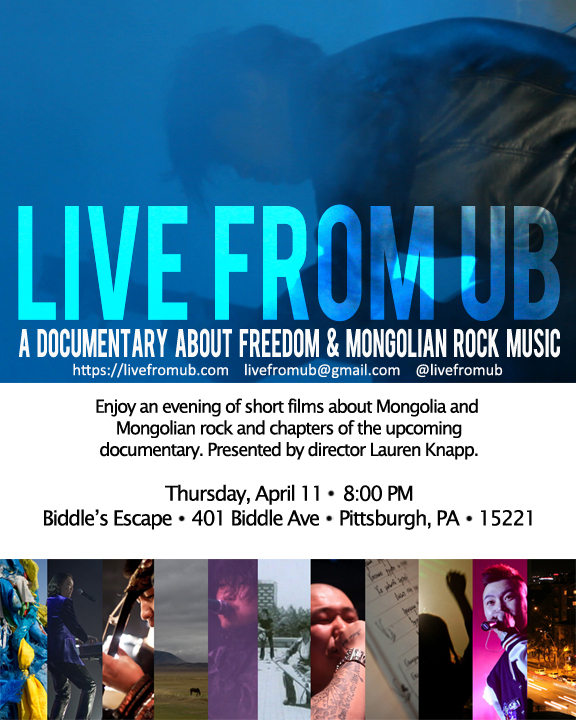 I’m an American journalist, photographer and videographer and will be spending the next nine months documenting the intersection of urbanization and music in the Mongolian capital city, Ulaanbaatar. I’m interested in understanding how Mongolian youth use hip-hop and popular music to deal with a rapidly urbanizing society. Increased mining, population growth, and climate change are all dramatically impacting the traditional nomadic lifestyle nearly 1 million Mongolians still practice. Unable to sustain their herds, many nomads are selling their goats, cows, and yaks and moving their gers (yurts) to the outskirts of Ulaanbaatar and other population centers in hopes of steady work. The transition from nomadic to city life is a dramatic one. I hope to capture the ways in which youth are using music to deal with this quickly changing culture. I’ll be keeping this blog throughout my time as a way to process and share my experiences in the Land of the Blue Sky and invite you to follow along!